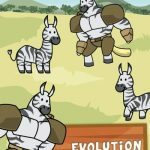 Goat Evolution is a very similar game in concept to Cow Evolution, and it’s made by the exact same developer – Tapps. The game is available for both iOS and Android platforms and in terms of mechanics, it pretty much works the same way as Cow Evolution. You get to evolve goats instead of cows, breeding them and mutating them and creating new, mysterious creatures. And if it was literal bull you-know-what helping you earn money and buy new creatures in Cow Evolution, this game has goat poop coins as a rather odd form of currency. 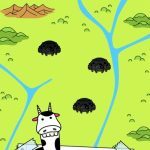 So if you’re ready to grow those goats and evolve them to the point you can see them from outer space, do check out our share of Goat Evolution cheats, tips and hints right after the jump. 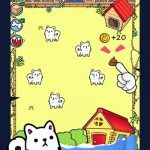 The same logic holds true in Goat Evolution – bigger goats earn more coins for you. You can get more goats by opening the boxes that crop up on your farm, and while they’re fairly small at first, you can head to the power-up with the box icon to upgrade your boxes and get a better chance of getting a larger goat. The magnet power-up works by automatically merging goats. The berry power-up allow you to enjoy some special effects and upgrade them accordingly. Then you’ve got the tractor power-up, which can gather coins for you even if you’re not playing. If you keep upgrading these, you’ll have a better chance of scoring some rare goats. Here’s a neat trick you can try when you’re going to be away from your device. Simply set your phone or tablet up in such a way that it won’t go to sleep mode, go to the highest level you’re allowed to access, and place your phone down so as to allow the biggest goats on your farm to keep on pooping. 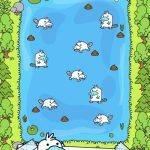 Again, larger goats mean more valuable poop, so let that goat excrement earn you a fortune in this game. Diamonds again serve as Goat Evolution’s premium currency, and you can get more of these by using the berries. If you give a goat a blue berry, it will poop out a diamond. Using the gold berry allows a goat to poop coins, while red berries cause goats to really let ‘er rip, and poop with reckless abandon. The latter berry should ideally be given to your largest, most evolved goat. Want a quick way to earn more money from your tractor? The quick way we’re referring to is the time lapse cheat, which you can use so that you don’t have to wait long for your tractor to net you some money. Advance your device’s time in order to skip the waiting period, but be aware that setting the time back to normal means you’ll be punished by not having access to the tractor for one whole day. Sometimes, it’s really better to tough it out than wait, as Tapps appears to have “nerfed” the time lapse cheat right from the get-go.